Hockey was secondary tonight as the Swift Current Broncos and Moose Jaw Warriors took the ice. The teams gathered together around the face-off circle to pay tribute in a moment of silence for the victims of yesterday’s Humboldt Broncos bus crash. It was a touching display of unity from two fierce rivals. Boy you could really hear the @SCBroncos fans in Moose Jaw tonight. Great job by them creating an almost home like atmosphere at times for the road team. “Good evening hockey fans in southwest Saskatchewan and across the hockey world… fans are filing in to Mosaic Place ready for our usual Saturday night ritual. But it’s there’s a dark cloud hovering over the proceedings. For every fan that came tonight ready to cheer on their favourite team and support their favourite players at that special time of year where the games take on new meaning… there’s that raw gnawing feeling in the pit of our stomachs reminding us all of something we lost. Something much more important than the puck they’ll drop tonight. Last night as they’ve done hundreds of times before and thousands of players, coaches, staff and media have done thousands of times in similar towns and cities across our country… the Humboldt Broncos filed onto their bus to take the next step in their hockey dream and chase championship glory on the road to Nipawin. They sat beside their friends in their usual spots… some staring out the window imagining that night’s game. Some joking and pranking. Some listening to music or dozing off. And suddenly in one horrible moment their lives were either taken or irreparably changed. A collision last night caused the tragic loss now of 15 members of the Humboldt Broncos family. Of the hockey family. And today there isn’t a heart or mind in the game that isn’t with those families. Today the Moose Jaw Warriors and Swift Current Broncos will come together to pray and play for their friends and comrades. They’ll do it with a heavy heart, but they won’t forget. We won’t forget. In Swift Current we sadly know this kind of tragedy all too well. None of us will ever forget, but we will do our best to help them heal. Any of us who have spent a significant amount of time on a hockey bus could picture it. Where everyone was sitting. Coaches cutting video clips, players napping on the floor, showing each other a funny text they got, watching a movie on their iPad… and you know there’s a card game going in the back. One year ago today there was a horrific buzz at Mosaic Place just before we went on the air for Game 1 between the Swift Current Broncos and Moose Jaw Warriors. Something awful had happened with the Humboldt Broncos on the road to their playoff game in Nipawin. Nobody really knew how serious it was and the information was only really starting to filter in as the players got ready for puck drop. Coaches found out and would let their teams know at the conclusion of the game. I honestly don’t remember anything about Game 1 outside of this horrible feeling in the pit that this didn’t matter right now and how on earth can you focus on the excitement of a game while the hockey world is dealing with this kind of loss? On that note today I don’t think there is any sense giving much thought to the game itself. If you’d like to take a look back you can click here for the link to our recap from Swift Current Online. It also includes video of Swift Current’s goals that night. Otherwise all thoughts today will be with the family and friends of those hurt or lost in that awful crash last year. The connections to Swift Current run deep from the shared heartbreak of two communities experiencing the heartbreak of a hockey team touched by a deadly crash to all the personal links. The name Broncos will always be bonded in shared grief. We know Ryan Gobeil of the Broncos front office has gone on to hold two massive fundraisers for STARS Ambulance after all his brother Morgan went through. We know Matteo Gennaro of the Broncos spoke at the funeral for his best friend Stephen Wack a day after winning Game 7 against Moose Jaw. 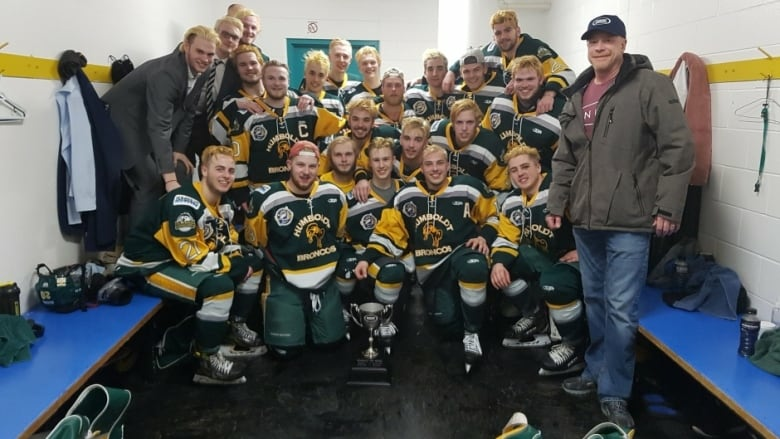 We know now Swift Current coach Dean Brockman returned quickly to Humboldt to help with the aftermath in the community where he had coached for 17 years. We know former Broncos from 1986 also found their way to the community to offer their support. Just on our broadcast team intermission analyst Joell Haugan was cousins with Humboldt’s coach Darcy Haugan and shared so much with us about the great man he was. I thought back to interviewing Adam Herold for a podcast I did ahead of his selection in the bantam draft. What an impressive and mature young man he was. I could go on and one listing those connections. We remember all the vigils across Canada and packing into the iPlex sharing our grief. At Golden West we remember our colleagues Tyler Bieber and Brody Hinz. I have learned a lot about Tyler from people who were great friends of his and wish I knew him the way they did. He left a tremendous legacy with his passion for local sports and volunteerism in his community. As a fellow broadcaster you feel like attaching yourself to Tyler, but he wasn’t like many of us in our intense pursuit of and focus on calling hockey games. His community work in sports was his biggest passion from what I understand. That’s the legacy he leaves. A true on air talent and from what I’ve learned an even better friend. It was a weird feeling being able to feel a connection with those who were lost without really having anyone specific to grieve. I think all our hearts were heavy with grief for those families and friends even if we didn’t have to live with that same kind of awful loss ourselves. Better writers than me with a better grasp of how to take that day will write much more impactful things today. I just don’t think I can spend the time to really dig into that game because it just doesn’t matter. Not right now. What I think I’ll remember most about the broadcast is sitting in the media room with Kelly Remple asking him how on earth do I call this game tonight? How can you be excited about a goal while there are families on pins and needles waiting to hear about their children? It was the most surreal and heart wrenching night. But the other thing I’ll always remember is how the hockey community, the country and really people around the world came together to support those families. Sometimes in tragedy we learn about the worst in people. Sometimes we see their best. I’m glad we saw the best in a lot of people out of this horrible loss. Now one year later all I can think is that I hope those who continue to grieve today are closer to some level of peace. They are in all our thoughts. The monkey is officially off Swift Current’s back. Stuart Skinner made 36 saves as the Swift Current Broncos played terrific defensive hockey down the stretch to beat Regina 3-2 and eliminate the Pats after a first-round series that went the distance. There are 11 players left from last season’s Broncos team that Regina eliminated in the second round, three players on the Broncos now from a Calgary club that Regina beat in the first round last year and three more from a Lethbridge squad that lost to the Pats in back-to-back seasons. I’ve only been able to find 8 Game 7s in @SCBroncos history. They are 5-3 in those games including 1-1 in Game 7s last season. The Broncos haven’t hosted a Game 7 since a 4-1 loss to Medicine Hat in 2009. ICYMI: Witness photos, highlights and recap last night’s #SCB huge Game 7 victory over @WHLPats to advance to Round Two of #WHLPlayoffs! A gutsy win by the @SCBroncos tonight kudos to the group for battling through a strange series and playing the right way tonight. That’s a good sign for the next round. On another note in my dealing with the @WHLPats they were nothing but class on all fronts. All the best to everyone there as they get ready to host in May. People shouldn’t underestimate that team. At the beginning of the Regina/Swift Current series no one would have been surprised by a Game 7. They probably would not have expected a series of lopsided games. Would we ever see a classic game in this third playoff series between these two rivals in the last four seasons? In Swift Current nerves were running high. Regina fans knew that no matter what happens in Game 7 they will see hockey again when hosting the Memorial Cup. For the Broncos a loss in Game 7 would be perhaps the biggest on-ice disappointment in franchise history. Of course we knew how evenly matched the two teams were, but to make the kinds of moves they made at the deadline and lose to the Pats again!? That would have been the toughest of tough pills to swallow for Swift Current fans. The other big question going into the deciding game was who would be healthy among the players who have battled injury in the series. Game 7. April 2nd, 2018. I can almost feel the tension again. Our review in 24 hours. ATTN Season Ticket Holders, tickets for Game 7 #SCvsREG will go on sale at 8:00am Monday morning! You will have until 1:00pm on Monday to purchase/pick up tickets. Best option is online! If @SCBroncos fans are looking for positives among them should be they’ve only allowed four combined goals in three games at home in the series so far. That bodes well for Game 7. I’m not saying it was a good performance don’t get me wrong I’m just saying it seems like it happened to both teams last night. This team does almost always rebound from bad games so we’ll see. The Swift Current Broncos and Regina Pats were so closely matched it almost seemed destined for a Game 7. This just wasn’t the way anyone would have expected to get there. A series full of lopsided games with no momentum for either team continued in that direction as Regina beat Swift Current 7-2 in Game 6 tonight. That results comes off a 5-2 Swift Current win in Game 5, a 6-3 Regina win in Game 4 and a 4-1 Broncos win in Game 3. For two closely matched teams they haven’t really created closely contested games. One of the most explosive goal scorers in the Canadian Hockey League delivered big in the clutch again. 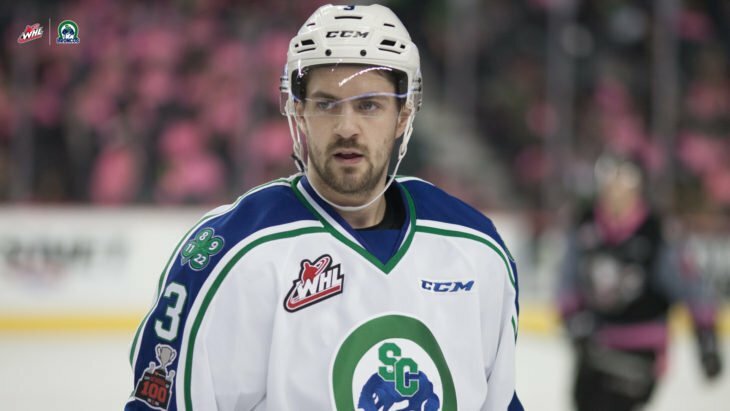 Tyler Steenbergen scored a hat-trick leading the Swift Current Broncos to a 5-2 win over Regina in Game 5 of a tied first-round WHL playoff series. Predictions for Game 5 in @City_SC tonight? Henry on the PP gives Regina the 1-0 lead. Pats outshooting Swift Curreng 14-3. We’ll see if the Broncos can be the first team in this series to overcome an early deficit. The @SCBroncos get PP goals from Steenbergen and Gawdin to take a 2-1 lead after 1 on @TheEagle94one First time in this series a team has come from behind to tie and take the lead. Are we in for that first epic game of the series? Playoffs are an emotinoal roller coaster for sure. After the first and third games of the series the fans in Swift Current were riding high. After giving up six goals in Game 4 there were some very nervous fans worried about a team that went all in golfing early at the hands of the same organization that had knocked them out of the playoffs in two of the past three seasons. The good news on the off day was that Josh Anderson had inked his NHL contract with the Colorado Avalanche and became one of several Broncos to turn pro in the 2018-19 season. That of course made Dean Brockman’s job tougher this season, but it is always a positive for the organization to see their players get a chance to advance their careers. Beyond that there was a lot of nail biting ahead of a big Game 5 on March 30th. It’a amazing the emotion of playoffs for fans. With every win all is right with the world and we dream of future glory, with every loss a full investigation of all flaws and concern it’s slipping away… as always it’s somewhere in the middle, but the emotion is part of the fun. Funny story from last night in Regina. @McCormackA2 and I were eating at Bonzini (a good spot!) after the game and in our suits the very nice server asked us if we were coaches. A good case of humble pie and a nice laugh. Good thing we already tipped! But in conclusion @Phil_Andrews_ and @JDUMBA22 they love you boys at Bonzini!